The altar “Worship of the Witch” is one of the artist’s most vivid and impressive works. Here is a scene of the arrival of the Magi to worship the infant Jesus. Magi noticed in the east an unusually bright star, called Bethlehem, and, guided by it, came to Bethlehem. The appearance of such a bright star told astrologers and magicians about the birth of an unusual baby. On arrival, the Magi carefully examine the baby, he must perfectly correspond to all the canons. Magus among the peoples of the Ancient East – a wise man who knew the secret forces of nature, watching the movement of the stars, predicting the fate of the stars. The ancient Slavs – a sorcerer, sorcerer, prophet, minister of pre-Christian cults. The most famous are the three sorcerers who appeared with gifts in Bethlehem for the worship of the infant Jesus. In the Gospel the names of the Magi are not indicated, but according to tradition they are called Balthasar, the lord of treasures, Yasper is white and Melchior is the king of light. The first of them brought a gift of gold to Jesus as a symbol of royal power; the second is incense in recognition of his divinity, the third is myrrh, which was used in embalming, as a prophetic indication of the martyr’s death that was awaiting Christ. The central panel of the folding altar “Adoration of the Magi” depicts the scene of the arrival of the Magi to worship the infant Jesus. Here the artist showed the moment when Yasper carefully examines the child, the Virgin Mary is calm, this is a loving mother, and the child is merry and plays with the venerable magician. “Adoration of the Magi” is a folding altar consisting of three parts. On the external panels on the reverse side are St. Catherine of Alexandria and St. Agnes. This is how the altar looks when the side doors are closed. 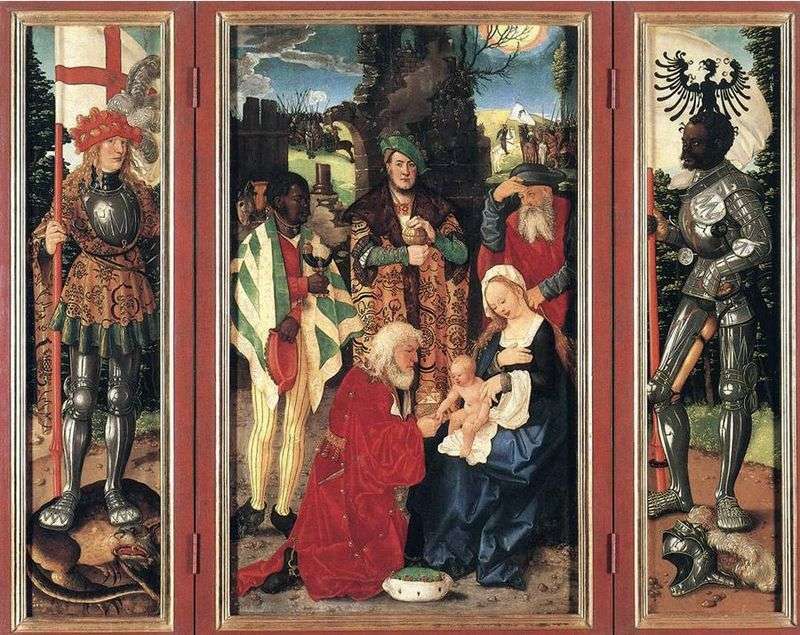 Description and meaning of the painting Adoration of the Magi by Hans Baldung.